Among the many books published on 3G and cellular telecommunications, this introduction stands out due to its broad coverage of the subject and straightforward explanations of the principles and applications using a minimum of maths. Writing as an engineer for engineers, Ian Poole provides a systems-level view of the fundamentals that will enhance the understanding of engineers involved working in this fast-paced field. Equally, the book helps students, technicians and equipment manufacturers to gain a working knowledge of the applications and technologies involved in cellular communications equipment and networks. The book focuses on the latest 2G, 2.5G and 3G technologies, including GSM (with GPRS and EDGE), NA-TDMA, cdmaOne (IS-95), CDMA2000 and UMTS (W-CDMA), with material on developing areas such as HSDPA. 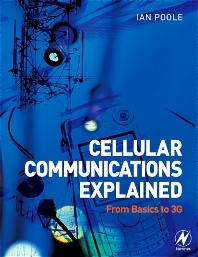 The fundamentals of radio propagation, modulation and cellular basics are also covered in a way that will give readers a real grasp of how cellular communications systems and equipment work. Explains the principles and applications of cellular communications systems using a minimum of mathematics, providing a firm grounding for engineers, technicians and students. Covers current technologies (2G, 2.5G) alongside 3G and other cutting-edge technologies, making this essential reading, not crystal ball gazing! Provides coverage of fundamentals and whole systems, as well as equipment provides a wide knowledge base for engineers and technicians working in different parts of the industry: handset designers, network planners, maintenance technicians, technical sales, etc. Engineers involved in the design of cellular telecoms equipment, seeking a systems-level overview of the subject. Engineers involved in network planning and deployment of networks. Equipment manufacturers. Technicians involved in the installation, maintenance and repair of cellular telecoms equipment including handsets and base stations. Students / lecturers seeking an introduction to cellular telecoms with a practical focus. Ian Poole is an established electronics engineering consultant with considerable experience in the communications and cellular markets. He is the author of a number books on radio and electronics and he has contributed to many magazines in the UK and worldwide. He is also winner of the inaugural Bill Orr Award for technical writing from the ARRL.